The Lancaster B Mk III is a Rank IV British heavy bomber with a battle rating of 5.0 (AB), 5.7 (RB), and 6.0 (SB). This aircraft was in the game since the start of the Open Beta Test prior to Update 1.27. 8 mm Steel plates behind the pilot headrests. 6.35 mm Steel plate behind the engines. The Lancaster B Mk III can be outfitted with the following ordinance"
It is best to fly the Lancaster at a high altitude, at least 4000m, to be able to be unhindered by fighter aircraft. Beware, the aircraft has no defensive armament on the underside of the plane allowing an easy kill for experienced pilots. Due to this, and the large bomb load of the plane, it is best to target mini-bases and airfields, as moving tank columns are extremely difficult to hit, and even static targets like pillboxes can be tricky. Its defensive armament is lacking, so it is best to avoid enemy fighters altogether rather than attempting to fend them off. If you do find yourself under attack, weaving the plane left/right and up/down can help you dodge most of the fire, while allowing your turrets to still shoot back. 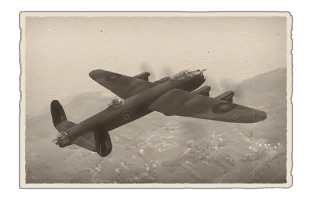 In real life, the Lancaster was mainly used as a Strategic Night Bomber, used in very large numbers to carpet bomb large industrial areas and cities in Germany, a role which is performed in admirably. Fighters struggled to intercept them in the dark and Anti Aircraft guns would find it difficult to target them effectively, especially if they were used in large numbers. However, this role does not really fit War Thunder. You rarely come across night missions, you will probably be playing individually as opposed to in a bomber formation and the map will be swarming with enemy fighters, who will all be licking their lips at the concept of an easy bomber kill. Tie this in with poor defensive armament and not particularly impressive performance and you have a recipe for disaster. 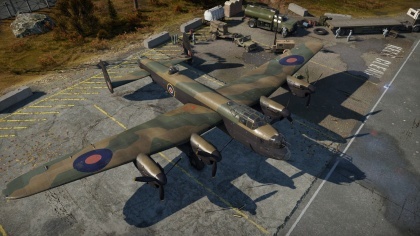 Therefore, the Lancaster suffers in War Thunder on arcade and realistic air battles and will be an exceptionally easy target in ground realistic battles. If it has any advantages, it is that it the Lancaster can carry a powerful payload. With the 2 x 4,000 lb bomb load, the plane can be put into a shallow dive to quickly reach and destroy 2 mini-bases (1 bomb for each), before most enemy fighters have climbed to altitude. 7.7 mm machine gun fire won't do much against German Fighters. When using gunner view the different calibre turrets make it difficult to hit a target with both bullet streams. Even when the turrets hit, it doesnt do any damage. most fighters will knock out your engines before you can kill their engines or pilots or at all. With RAF Bomber Command’s focus being centred on the strategic bombing campaign against German industry, the RAF desperately required a force of heavy bombers to increase the capability provided by their medium bomber fleet. A twin engine Avro Manchester bomber was converted to be powered by four engines and first flown in January 1941. This and subsequent prototypes were deemed to be so successful that the first production variant of the new bomber, now named the Lancaster, was flown in October 1941. The immediate success of the Lancaster Mk I (redesignated the BI in 1942) caused it to be pushed ahead in terms of production priorities. In turn, this threatened the supply of Rolls Royce Merlin engines which powered it, so alternative engines needed to be sourced. The BII was powered by Bristol Hercules engines, but this caused a drop in performance and payload. The BIII was powered by Packard Merlin engines, a license built version manufactured in the United States. Internal differences between the BI and BIII were very few; the two models had near identical technical characteristics and armament and externally the BIII had only a larger bomb aimer’s bubble window, but the change in designation was necessary since the different engines had different servicing requirements. The Lancaster was first used operationally in March 1942 by No. 44 Squadron. It soon became the backbone of RAF Bomber Command’s offensive against the heart of Germany, but was also used against targets all across occupied Europe. The majority of Lancaster operations took place at night, due to RAF Bomber Command’s policy of night bombing whilst the bombers of the United States Army Air Force tackled targets by day. For defence, the Lancaster had eight 0.303 inch Colt-Browning Mk.II machine guns located in three turrets: two guns were located in the nose, two in the dorsal turret, and four in the tail turret. The maximum ordinance capacity of the Lancaster was the highest of any heavy bomber in World War II: 14,000 lb (6,356 kg). Besides standard bombs, the aircraft could carry an 8,000 lb (3,632 kg) “blockbuster” or two 4,000 lb (1,816 kg) high-explosive “cookie” bombs. Special modifications of the bomber could carry even larger bombs, such as the 22,000 lb ‘Grand Slam’ bomb. The Lancaster became legendary on the night of May 17th 1943 when bombers of No 617 Squadron breached the Mohne and Eder dams in Germany with Barnes Wallis’ genius ‘bouncing bomb’. Lancasters of Nos 9 and 617 Squadrons also sank the German battleship ‘Tirpitz’ with 12,000 lb ‘Tallboy’ bombs, also designed by Wallis. A total of 3,039 BIII bombers were produced. The bomber was finally decommissioned in Great Britain in 1950, and is a serious contender to the claim of being the most capable bomber of the entire war. This page was last edited on 15 March 2019, at 23:46.